David G. Schultenover, SJ, is Henri de Lubac Professor of Historical Theology at Marquette University and editor in chief of Theological Studies. In 1975 he received his PhD in historical theology from St. Louis University with a concentration on Roman Catholic Modernism and, more specifically, George Tyrrell. Among his publications are George Tyrrell: In Search of Catholicism and A View from Rome: On the Eve of the Modernist Crisis. "[This book] sets out to explore the event, implications, and interpretations of Vatican II, to advance its ongoing relevance, and to make the case for its `unfinished business' half a century later. The results are an impressive success." Already when reading many of these articles in Theological Studies I was hoping they would become available as a book. I am sure that this collection will become a landmark in the reception of Vatican II 50 years on, as was the case with the Herder Theologischer Kommentar zum Zweiten Vatikanischen Konzil 10 years ago. Even if the Council documents hesitated to use the term "reform," the famous 2005 speech by Pope Benedict on the hermeneutics of reform inspires many authors in this volume to take the implicit pleas of Vatican II for a reform of the Church more seriously. Very prophetic indeed, if one realizes that most contributions were written before the start of the current pontificate. This book offers very challenging and diverse insights on the worldwide reception and hermeneutics of Vatican II and postconciliar Catholic thought. Fifty years after the Second Vatican Council (1962–1965) some of the world's finest Catholic scholars explore the continuing significance of the council's teaching for our time, including its capacity to inform the mission of the church in a vastly different context. This collection is required reading for anyone interested in exploring the interpretation and reception of the council's insights today. "A powerful, authoritative and comprehensive collection of excellent scholarly articles from Theological Studies, brought together into a solid and very useful guide to what went on at the Council II and later." "What is offered here are general interpretations of the council; the book's tone is scholarly but accessible to nonspecialists. This impressive collection doubtlessly delivers the `riches' cited in the book's title." Finally, there is no longer the need to search repeatedly through the issues of Theological Studies looking for recent articles on Vatican II. In celebration of the 50th anniversary of the council's closing, the journal's editor, David Schultenover, has gathered in one volume a masterful and contemporary compendium of the finest contributions by top scholars. The cohesion and complementarity of the collection is truly remarkable, allowing it to be read easily from cover to cover. In fifty years, it will still stand as one of the most valuable contributions of our time. This is a golden collection to mark a golden anniversary! Though it concluded only fifty years ago, Vatican II played out in a different world and in ways that seem complicated and even mysterious to today's readers. This collection will long remain a valuable resource for unlocking the meaning of the council and its interpretation. 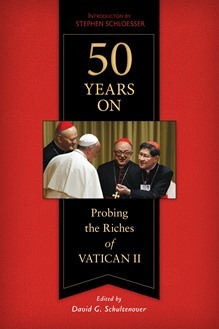 Some of the best scholars in this field contributed to several issues of Theological Studies during the council's jubilee, and these selections comprise a truly fitting tribute to the council that created the contemporary Catholic Church and shaped relations among Christians and among all people of goodwill into the present century.